Our poster featuring Gunship Revolution mascot, La Capitana Gabriela Ricarte. Come in, come in, the night is young. Senior Art Directors Brian Valeza and Kriss Sison setting up the show. Finance Director Wilfred Custodio and wife May-Ann sends their regards. The night was marked by many a cutthroat game of Uno. Gunship Revolution Artist of the Year 2016 Brian Fajardo does a live painting session because of course we'd still be painting in our party. Senior Art Director Brian Valeza brings dragons to life live. Justine Cruz gets the demo chair as a game of jenga plays on behind him. Managing Director Emmanuel Javier steadies his hand against the tower. Justine Cruz tries not to bring the tower down. 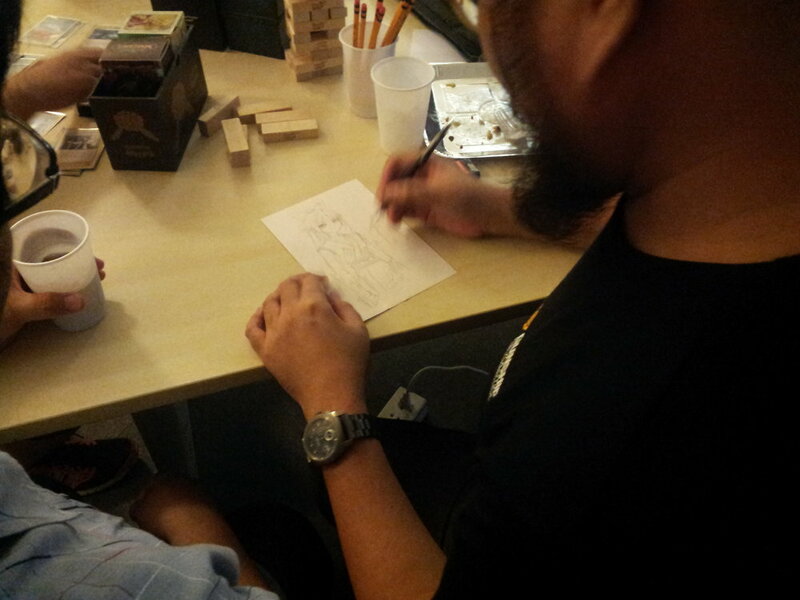 Wait... Is that Senior Art Director Kriss Sison with Ninja Girl Ko Writer Marco Dimaano? Are they up to something? Ninja Girl Ko sketch over conversation. Managing Director Emman Javier, silently judging your dietary choices. Jen Santos picks out a slice. Rafael Cal-Ortiz hides behind his cards. Battalionite Sam dela Torre catches a candid shot. Wilfred Custodio challenges Tim Terrenal to a Pokemon battle. How else do you think we celebrate Friday Nights? New Artists, Battalion Challengers, and friends. Patsy Lascano also guest stars. As the night goes on, Rafael Cal-Ortiz, Tim Terrenal and Hinchel Or vye for more mature card games. As hard as we are capable of partying under the circumstances. The Wolfram House guys bask in the familiar glow of a live Cintiq. Brian's latest creation comes to life. An address from the CEO. Brian Fajardo delivers his 2017 plans. Rafael Cal-Ortiz in a staring contest with a one-eyed woman. Tim Terrenal outlining his goals. Jen Santos and Tracy Gibson take short nap breaks, as guaranteed by the Gunship Revolution charter of 2013. Kriss Sison whips up a party sketch. Senior Art Director Kriss Sison leaves guest Michelle Ladia home with a souvenir sketch. Managing Director Emmanuel Javier immortalizes the event by leaving a (decidedly delible) mark.